Well, artichokes take a while to steam, and I had a starving 9-year-old "Sprout" bouncing around the kitchen anticipating her favorite veggie, so I decided to distract her by having her help make a rice pilaf-type thingy to go with. Since Sprout was assisting me in the kitchen, the rice ended up with several of her OTHER favorites, garbanzos and pistachios. And it turned out GREAT! The combination was such an accidental hit with my kids, I made it for a potluck yesterday and again, it disappeared quickly. The secret to our rice is a spice blend called za'atar. Za'atar is generally prepared using ground dried thyme, oregano, marjoram, or some combination thereof, mixed with toasted sesame seeds and sometimes, salt. I prefer the version that also has sumac, and is more tangy and reddish in color - TOTALLY delicious stuff. I discovered it several years ago and use it often in roasted veggies, potatoes and hummus. You can find it at Middle Eastern markets and specialty grocery stores. (You CAN sub some thyme, oregano, sesame seeds and a squeeze of lemon juice if you really have to). Put vermicelli and oil in a deep, covered pan suitable for cooking rice. Add rice, broth, garbanzos and water and mix well. Bring to a boil and then lower heat and simmer for 25 minutes until rice is cooked, checking once or so to make sure it's not sticking. Turn heat off and let sit a few minutes. 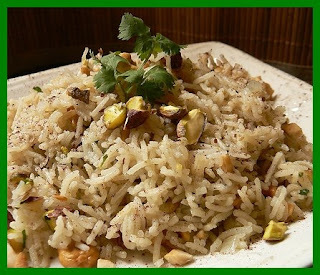 Stir the pilaf, add seasonings and serve garnished with pistachios. My 'Sprout' loved breaking up the angel-hair pasta into small bits (we did this over the sink, because the stuff flies EVERYwhere..) as well as opening the can of garbanzos, draining them and dumping into the rice. She also chopped the nuts and shook in the spices. You know, I've never had a real artichoke. Only the marinated ones that come in a can. I'll have to give this a try sometime. Generally I"m not a huge fan of artichokes (mostly because of all the work), but they have been 50 cents for organic ones at our farmer's market... so we've had some lately. Yum! 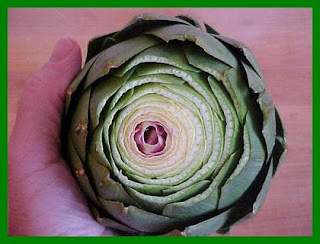 i have never had an artichoke...at least not a fresh one..but i have had the marinated artichoke hearts if that counts. they just intimidate me in the store so much! maybe i will dive in and see what happens! Divine!! I need to cook more with artichokes. OOOOHHHH . . . I made my own za'atar around the holidays for a special party feast, and now have a ton of it left! Thanks for the idea! i love simple satisfying rice dishes. I'll be going to the Middle Eastern market today for cheap tahini, so I look for za-tar! the pilaf looks really good. gotta love rice & garbanzos :). thanks for the tip on za'atar.